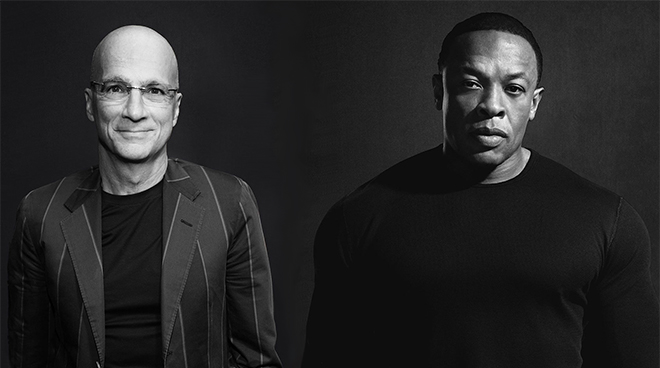 A report on Thursday claims Apple's much rumored deal to buy Beats Electronics "is happening" and will be a play for company cofounders Jimmy Iovine and Dr. Dre, not technology associated with streaming music or headphones. Citing a "well-placed" source familiar with the ongoing talks, TechCrunch affirms what a number of pundits have already speculated; that Apple is looking to "acqui-hire" Iovine and Dre, whose real name is Andre Young, in a rumored $3.2 billion deal to buy Beats. "They want Jimmy and they want Dre," the unnamed source said. "He's got fashion and culture completely locked up." The person went on to say that the Apple-Beats tie-up "is happening," but nearly fell apart multiple times. The source is not completely confident of the acquisition's fate, however, and can only say with "70 percent certainty" that an agreement will be reached. Later in the report the person hedges that number by noting "the deal hasn't fallen apart yet." In the days following initial word of Apple's interest in Beats, The Wall Street Journal reported Iovine and Young would take senior positions at Cupertino if an acquisition was made. Their respective roles are unclear, though Iovine would likely have to leave his seat as chairman of record label Interscope Geffen A&M to move to Apple. Another report claimed Iovine was in separate discussions to serve as a "special advisor" to Tim Cook, though the possibility of that happening appears unlikely. Beats is currently operating as both a hardware and a software business. Despite mediocre reviews from critics, the firm's high-margin headphones are some of the most popular models on the market. In January the company launched a subscription-based streaming music service called Beats Music that accrued an estimated 110,000 paying subscribers as of March. Apple is said to be in the final stages of acquiring Beats for a supposed $3.2 billion, an announcement of which was expected last week. A follow-up report on Friday said official word would be pushed back to this week, while a separate report posits Iovine and Young could take the stage at this year's WWDC in June to be formally introduced as new Apple executives.